For those accusers out there who think I am just “bloody minded” about the 505, here’s a reminder that the fleet is still about choice. So please find some pictures and comments below regarding the new Ovington/Holgar boat. The hull deck joint is just a copy of the old Rondar and is inherently unstable and prone to movement which caused all the previous measurement problems along the shear line. 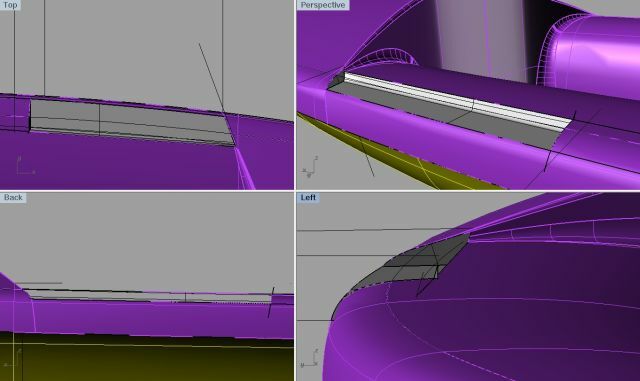 Unless moulded correctly, this again will cause the template baseline position to move along the hull sides, we will wait and see what the measurements look like. As an update on this, it does appear that the new Ovington is indeed too flat above the water-line, meaning that during the measurement the templates actually touch the centerline of the hull. Which probably means that the new Ovington boats intact does not measure under the current IRC 505 rules. I hear also in the grapevine that the forward bulkhead is too far forward again meaning that the boat does not measure on this station. Will Ovington retify the problem, Rondar’s didn’t because it costs too much. However, we do ask ourselves the question, if this boat was designed by computer and is so accurate, why didn’t anyone read the rules before the boat moulds were crafted? The recessed shroud tracks are nice if you want them, so if you don’t want them, you have a fairly horrible looking recess along the seat-tank area, otherwise it adds complication to the mould and I don’t see any benefit at all. The recessed rudder pivot points do what? Bring in the rudder within 8/10 mm of the stern of the boat, so what, I must check the rules and regulations to see if this is actually allowed. In terms of innovation I don’t see much at all, no floor strengthening, just the forward thwarts set as the Australian Kyrwood’s of the 80’s. It will still be a mess around the mast gate/foot area and under the deck for rigging. As for the hull, Holgar talks about optimization of the waterline length, well the reason why it can be longer is that all the Rondar’s were short. The Parker is already at maximum width and length on all sections. Lets see what happens on the water. So here are the recent tech drawings from Ovington via Holgar Jess yard in Germany, enjoy! Is the 505 going back to the dark days . . . . Yes, 9103 in France, 9107 in Sweden and 9108 in California. Takes us about 8 weeks in all to do a boat depending on your specification.